Original pop up outlet spare parts for EVOline products. Running a business can be so demanding since there’s literary no shortage of things to manage. You need to oversee the employees, time, budgets and productivity. But, is there something managers often forget to maintain that could end up saving businesses tones of time and improve efficiency? Almost all business is reliant on cables for facilitation of essentials like electricity and data. Surprisingly though, most managers neglect cable management, which is the one thing that could make work more comfortable and the office more conducive. EVOline products comprise innovative cable management systems that offer the perfect solutions for keeping power cords safe, functional and well organized. Regardless of whether you manage an office, production studio, retail space or data center, the highly advanced products from EVOline will ensure that your business observes all safety requirements. Products like Port and Dock Systems use cord covers. Push to reveal system and easy cable guides to smartly prevent cable-related issues like accidental trips, cable cuts, and naked power lines. Also, these products keep your work environment clean. By hiding cables under the desks with pop up outlets, tackling excess cord lengths makes it easier to clean the office and also prevents dust from collecting in small spaces. Today, the typical office desk is full of tech gadgets and equipment that are crucial to daily office tasks. Printers, computer peripherals, Smartphone, USB docks, and headsets are some of the workstation accessories common on most office desks. EVOline provides different innovative products that offer multifunctional tailored connections. These are easily interchangeable to connect your devices fast and efficiently. The EVOline Dock-Square, for example, includes a power cable small enough to affix to your desk. Yet versatile enough to connect multiple equipment like your laptop, USB-enable devices like mouse, keyboard, and Smartphone charging system. As well as extra exchangeable modules like VGA/HDMI plugs and data ports which can be easily attached when needed. Additionally, these EVOline systems can be easily fitted on kitchen surfaces, shelves, and other areas. For instance thanks to the two double-sided adhesive strips that securely stick the dock-square to any smooth surfaces. What’s more exciting about EVOline exchangeable modules is that you can design your tailored systems that fit and meet your needs. Whether you want extra power sockets, additional USB ports or extended HDMI cables. 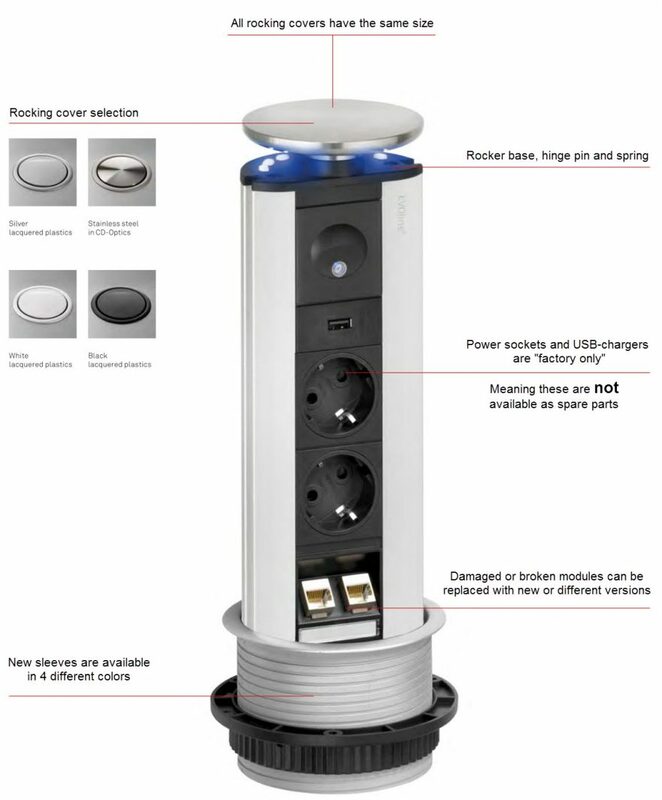 EVOline will make a custom pop up outlet cable management system according to your preferences. A modern office should be able to integrate new technological advancements quickly. Unfortunately, most office equipment and accessories get obsolete and unusable when a new product enters the market. Adapting to cutting-edge solutions helps a company to stay ahead of the completion. EVOline products save you money. Instead of throwing out old peripherals, you can replace them with newer models. For example, a few years ago, VGA was the ideal module for video connections. Today, the industry standard is HDMI and DisplayPort. Therefore, if you have an EVOline dock, instead of replacing the whole equipment you only need to install the newer HDMI module cable. Module replacement also applies to updated USB 3.1 Type C module cables, RJ45 Modular CAT6 modules, and DisplayPorts. You can also upgrade the dock to include the latest wireless charging surface. Exchanging old connection modules for the most recent standards ensures you avoid downtimes and ultimately save money. Pulling plugs out of sockets by the cord.